Physiological systems of animals operate in a fluid environment. Relative concentrations of water and solutes must be maintained within fairly narrow limits. 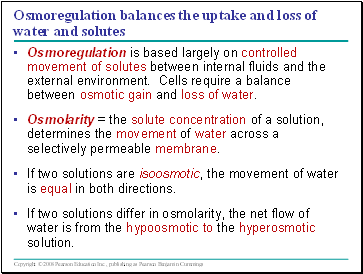 Osmoregulation regulates solute concentrations and balances the gain and loss of water. Freshwater animals show adaptations that reduce water uptake and conserve solutes. Desert and marine animals face desiccating environments that can quickly deplete body water. 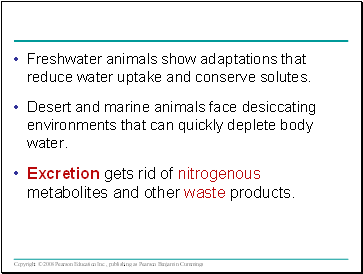 Excretion gets rid of nitrogenous metabolites and other waste products. 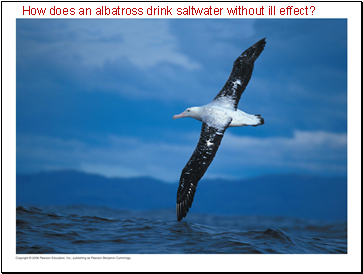 How does an albatross drink saltwater without ill effect? Osmoregulation is based largely on controlled movement of solutes between internal fluids and the external environment. 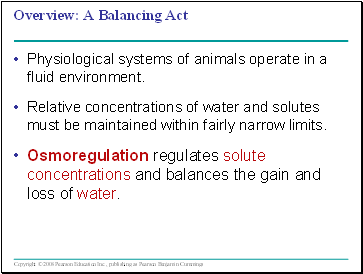 Cells require a balance between osmotic gain and loss of water. Osmolarity = the solute concentration of a solution, determines the movement of water across a selectively permeable membrane. If two solutions are isoosmotic, the movement of water is equal in both directions. 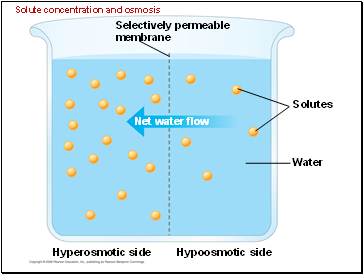 If two solutions differ in osmolarity, the net flow of water is from the hypoosmotic to the hyperosmotic solution. 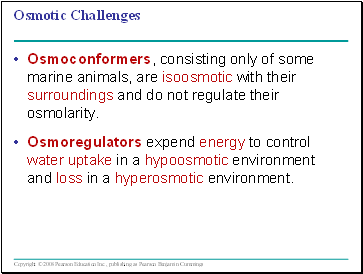 Osmoconformers, consisting only of some marine animals, are isoosmotic with their surroundings and do not regulate their osmolarity. Osmoregulators expend energy to control water uptake in a hypoosmotic environment and loss in a hyperosmotic environment. 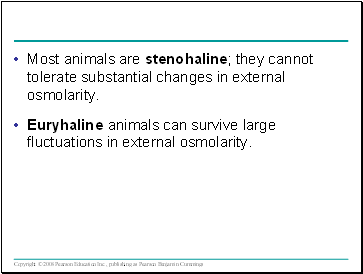 Most animals are stenohaline; they cannot tolerate substantial changes in external osmolarity. 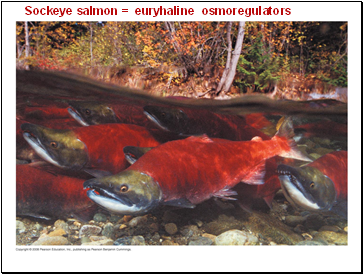 Euryhaline animals can survive large fluctuations in external osmolarity. Most marine invertebrates are osmoconformers. 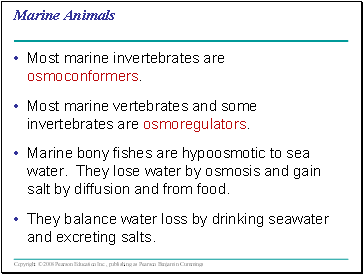 Most marine vertebrates and some invertebrates are osmoregulators. Marine bony fishes are hypoosmotic to sea water. They lose water by osmosis and gain salt by diffusion and from food.